"We added carrot and fresh garlic to this spaghetti sauce, and even made the meatballs healthier by using whole wheat breadcrumbs and fresh parsley. We suggest serving over the whole grain pasta of your choice." Combine ground beef, bread crumbs, parsley, Parmesan, 1/4 teaspoon black pepper, 1 clove garlic, and beaten egg in a large bowl. Mix well and form into 12 balls. Store covered in refrigerator until needed. Cook and stir onion, 5 cloves garlic, and olive oil in a large saucepan over medium heat until onions are translucent, 5 to 7 minutes. Stir in tomatoes, salt, sugar, and bay leaf. Cover with lid, reduce heat to low, and simmer for 60 minutes. Stir in tomato paste, 1/2 teaspoon ground black pepper, basil, and meatballs. Simmer on low heat until meatballs are cooked through, about 30 minutes. 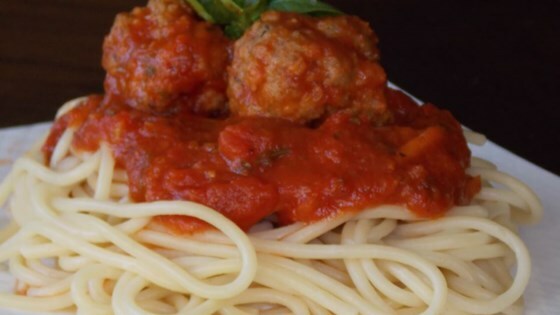 This recipe is a healthier version of Italian Spaghetti Sauce with Meatballs. Pretty tasty but I have to say I did not use 1/4 Cup olive oil. Even though it is a good for you fat, it still packs a punch in calories. This is a very fresh tasting sauce and the meatballs are good. Before adding the meatballs, crush any whole tomatoes that have not broken down. Simply and delicious. Certainly a "go-to" recipe from now on. Made this for my roommates and had rave reviews! The only thing I did differently was to add about 1/2 as much tomato paste as I prefer a thinner sauce.